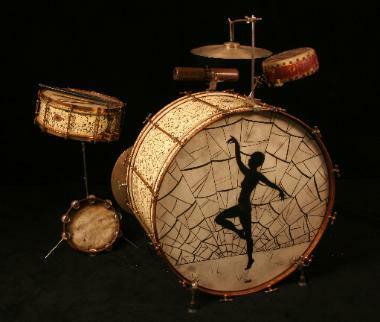 Here's a wonderful old drawing of a 20s-era drum kit: very accurate and faithful! I believe the two rectangular things at the base of the snare drum are sandpaper blocks. Rubbed together, sandpaper like that makes a fantastic percussion instrument: I love to use it especially in recording. (It's often not really loud enough for most live music applications). Also note the drum spur at the bottom of the bass drum. I've got some just like this: from the 20s or 30s, they have a pointy edge that gets right into a wood floor like a nail! Via a skew arrangement, they clamp onto the wooden rim of the bass drum. I've used mine quite a bit over the years, as I've often put together kits using an marching bass drum that's not equipped with its own built-in spurs. Ingenious, some of these old bits of hardware! And the threads? Not even a hint of becoming stripped out, after almost 100 years! That's back when metal work was METAL WORK, dammit! Another gorgeous old kit from 1929, made by Ludwig and Ludwig. Fabulous drum head painting (that's quite a peak in the distance: like Mt. Fuji on steroids) and what a beautiful finish: it's called "Peacock Pearl". I'd love to see a closeup of that. And doesn't the red of that Chinese tack head tom tom just leap out at you? Fantastic! Looks like some kind of extra-large sleigh bells mounted on a wooden handle there, too, resign inside the tambourine. Interesting! And there's that cymbal mounted on the bass drum, just to the right of the bass drum pedal. Now, how was this played? See notes on the photo directly below! 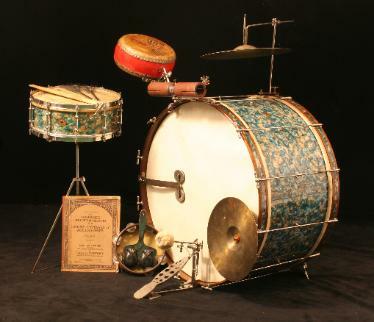 This kit is from the wonderful Olympic Drums website, and was sold to some lucky drummer and/or collector for the princely sum of $5,250. Wonder if it's ever being played, or instead is sitting in a museum or warehouse somewhere? More details on this kit at the original Olympic Drums page here. 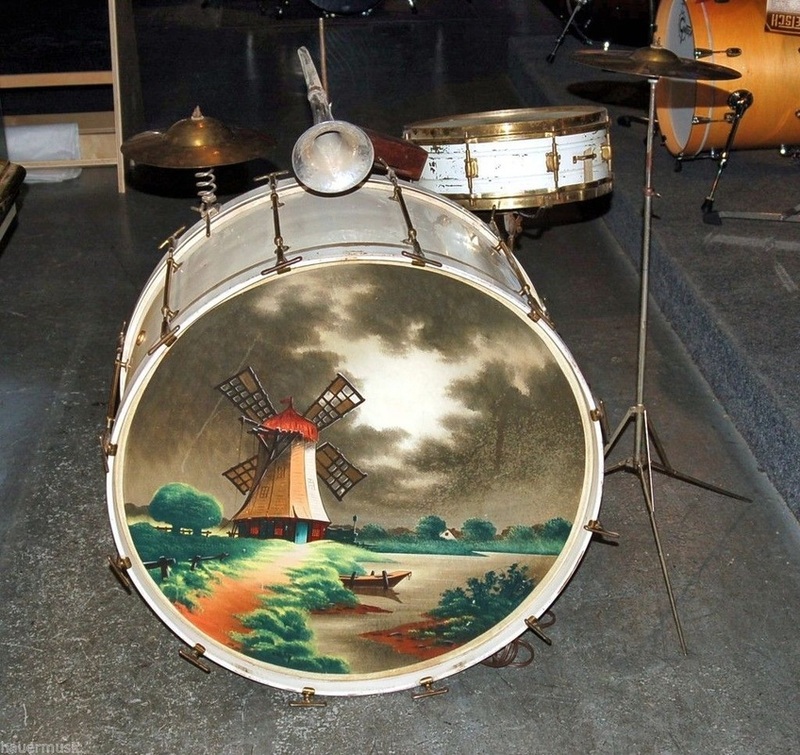 This old kit featured a very colorful windmill landscape, one of the relatively rare spring-type cymbal mounts, a woodblock and... a horn! A rather eccentric addition to a drum kit! This kit was being offered for sale at an online auction site. A winter scene adorns this very handsome old Ludwig and Ludwig bass drum. 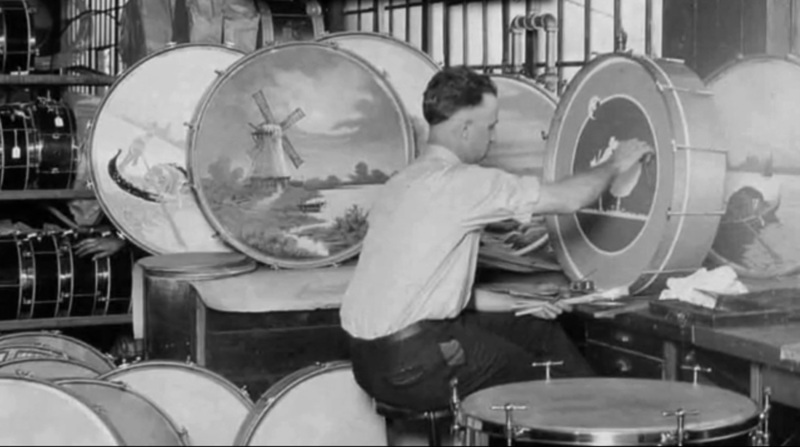 This is the only photo I've ever seen of bass drum heads being painted. This is obviously a drum factory, but I have no idea which company. There's that windmill, lake and boat scene, very similar to the one that we saw in the contemporary photo just above! A popular theme, it seems. 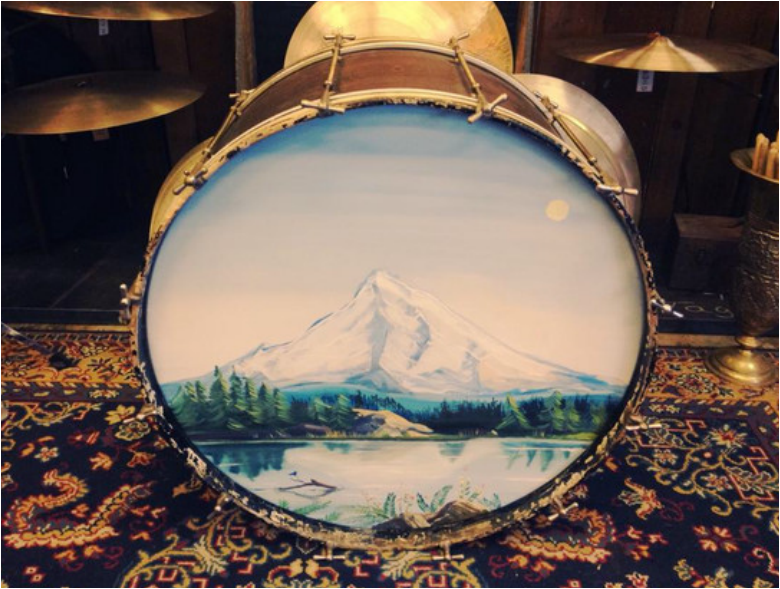 A totally snow covered mountain and lake adorn this old bass drum head. You like them tuned pretty high? I also love the sound of Gene Krupa's Radio King.